EASY POP UP. Durable foldable panels made of waterproof nylon cloth keep from leaking. Cool-down material give your pet fantastic spa experience. EASY TO DRAIN: Easy Twist Off Cap Drains to empty and the water can be poured out quickly. With bottom side drain, easy to drain and refresh water. 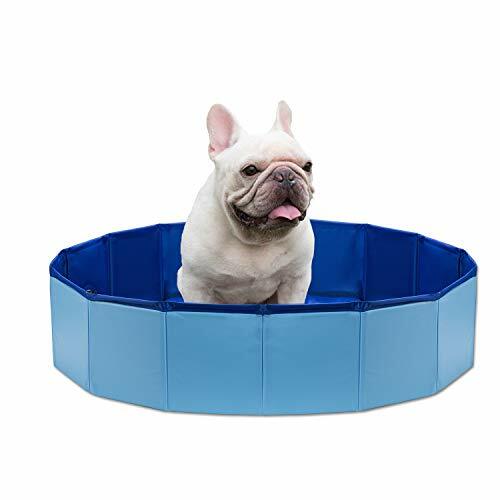 MEDIUM SIZE (8" deep by 31.5" diameter) allow for dogs to fully submerse their bodies sitting down, and splash around as desired. ECO FRIENDLY Meets EN71, ASTM standard. Please TRIM your dogs' nails before using the pool. 100% SATISFACTION GUARANTEE - When in doubt, feel free to reach out to us and we'll do our best to assist you. If you have any questions about this product by NHILES, contact us by completing and submitting the form below. If you are looking for a specif part number, please include it with your message.